After going 67-95 and finishing last in the AL West last year, the Texas Rangers seem like a team that’s going to be rebuilding for the next couple of years. However, they’ve brought in a lot of veteran players this winter and appear willing to give it an honest effort in 2019. Under new manager Chris Woodward, can the Rangers become a surprise team this season or will they endure another losing season and last-place finish. Texas had one of the worst rotations in baseball last year, but they have overhauled their rotation this winter to help prevent that from happening again. Mike Minor will return to lead the rotation after leading the team with 12 wins last season, but nearly everyone else is new. Lance Lynn was brought in to be a solid back-end starter. The Rangers are also giving Shelby Miller another chance despite injury and performance issues the past few seasons. At age 28, he may not be done yet, and he does have a fair amount of upside if he can turn things around. The Rangers are also taking a chance on both Edinson Volquez and Drew Smyly. Volquez didn’t pitch at all last year because of Tommy John surgery, but he might have something left in the tank that he can give the Rangers this season. Smyly, meanwhile, has missed the last two seasons because of Tommy John surgery. But he pitched well early in his career and still has plenty of upside if he can return to full health. Obviously, the likes of Miller, Volquez, and Smyly come with no guarantees. However, Texas has a few younger pitchers they can put on the mound if those guys aren’t healthy enough to pitch. Ariel Jurado and Yohander Mendez have both struggled in brief big league stints, but both continue to have a lot of promise. Jonathan Hernandez is another pitcher to watch for the second half of the season, as is lefty Taylor Hearn. The Texas bullpen will also take on a different look with guys like Alex Claudio, Jake Diekman, and Keone Kela all pitching elsewhere. However, the Rangers have made a long-term commitment to Jose Leclerc to be their closer after he pitched to a 1.56 ERA last season. Veterans Shawn Kelley and Jesse Chavez should serve as competent setup men while also providing some guidance for Leclerc in his first season as a closer. Of course, there is a fair amount of uncertainty in the Texas bullpen beyond the trio of Leclerc, Chavez, and Kelley. Zach McAllister could prove to be a solid addition, but he also posted a 6.20 ERA last season. Youngsters Nick Gardewine, Connor Sadzeck, and Jeffrey Springs showed some promise last year, but both are largely unproven in the majors. There are plenty of other unproven arms in the organization but no guarantee any of them will stick. Aside from the absence of the now-retired Adrian Beltre, the Rangers will have a lineup similar to the one they had last season. Joey Gallo will continue to anchor the Texas lineup after he blasted 40 home runs in 2018 despite a meager average of .206. Shin-Soo Choo will also be a big part of the Texas offense, as the Rangers are hoping to keep him healthy by making him the primary DH. Part of the key for the Rangers is getting more out of second baseman Rougned Odor, who saw his power drop from 30 home runs in 2017 to just 18 last year. They also need shortstop Elvis Andrus to bounce back after an elbow injury derailed his 2018 season. The performance of those two veterans will be key, as will Asdrubal Cabrera, who is still a productive big league hitter and will be asked to fill Beltre’s spot at third base. Texas is also taking a chance on Hunter Pence to see if he has anything left in the twilight of his career. Of course, the biggest X-factors for the Rangers are their younger players. 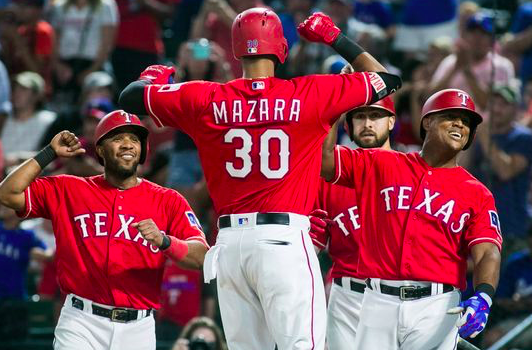 Nomar Mazara has hit exactly 20 home runs in each of his first three years in the majors. But he’s still only 24 and could be capable of taking his game to another level. The same could be true of Ronald Guzman, who has solidified the starting job at first base and could be ready to take another step forward in his development. Finally, the Rangers will probably need a little more offense out of the center field tandem of Delino DeShields and Carlos Tocci, even if they are both quality defensive players. Despite all of their offseason moves, the Ranges have a pitching staff being held together with scotch tape and glue. They probably lead the majors in optimistic “what ifs” heading into the season. Meanwhile, their lineup is a tad elderly and lacking table setters for all of the power they have in the middle of the order. Even if everything falls into place, the best they can hope for is being on the outskirts of the playoff race. Look for the Rangers to finish 64-98 this season, right around where they were a year ago.